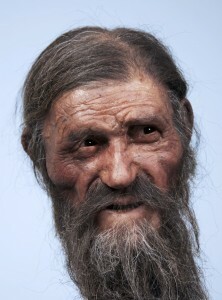 Ötzi—actually, his discovery—turns 20 this month and Italy’s South Tyrol Museum of Archaeology, where he now resides, is hosting a special exhibition in his honor called “Ötzi 20.” He may not yet be old enough to order a beer in the U.S., but the Iceman has a lot to celebrate in this show, which includes latest scientific findings and interpretations as well as a brand-new reconstruction by Netherlandish brothers Alfons and Adrie Kennis. 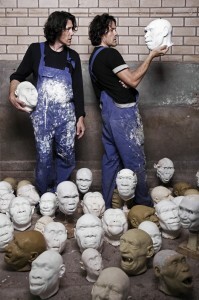 On the eve of the exhibition’s March 1 opening, Beat Gugger, curator of the “Ötzi 20” exhibition, and Swiss museum expert Andreas Putzer, archaeologist and co-curator of the show, kindly took time amid a flurry of preparations to answer my questions. Eti: What is the most surprising thing you’ve learned about Ötzi over the past 20 years? Beat Gugger: It is interesting how new scientific methods have been able to provide a highly detailed reconstruction of the life and death of Ötzi, and are still capable of revealing new aspects. Eti: What do we now know about his tattoos? Andreas Putzer: Ötzi’s tattoos are among the oldest evidence of tattoos and their therapeutic purposes. On his body can be seen some 50 tattoos in the form of groups of lines and crosses. Four groups of lines are located to the left of the lumbar region, one to the right, and three each on the left calf, the back of the right foot, and on the outer and inner right ankle. A cross can be seen on the inside of the right knee and in the area of his left Achilles tendon. Two tattooed lines also appear on his left wrist. Eti: Do we know any more about the technique used to apply them? Andreas Putzer: Unlike modern tattoos, Ötzi’s tattoos were not produced using needles but rather by fine cuts into which charcoal was subsequently rubbed. Bone or copper needles and flint may have been used as tattooing instruments. Eti: Are his tattoos reflected in the new reconstruction that was made for the exhibition? Beat Gugger: The new reconstruction will depict Ötzi with a naked torso. The tattoos on his back and wrist will therefore also be visible. Eti: Why was it so important to create a new reconstruction? Eti: What do you think is the most scientifically significant recent finding about Ötzi? Eti: What, to you, is the most personally interesting recent discovery about Ötzi? Beat Gugger: There was special excitement recently at the news that scientists had succeeded in decoding Ötzi’s genetic material. It must first be evaluated—we eagerly await the results. 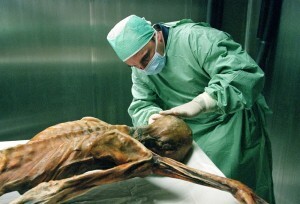 Eti: What are some of the “secrets” Ötzi still holds? Beat Gugger: There are still many open questions about his life and death. Scientists still have to clarify numerous questions in coming years about where and with what group of people Ötzi lived. We will never be able to discover everything about the life and death of Ötzi—and it is perhaps not such a bad thing if Ötzi keeps a few secrets to himself. Eti: What is Ötzi’s larger significance in the story of archaeology? Beat Gugger: Ötzi is a man from a period of over 5,000 years ago who, like a time traveler, has physically landed in the 20th and 21st centuries. He lived on the cusp of the Stone Age and the Bronze Age: owing to the Ötzi find, this epoch is particularly interesting for archaeologists and is now designated by researchers as the Copper Age. It goes without saying that archaeological research in the Alpine region is extremely interested in finds from this era. Eti: Why do you think Ötzi has become so popular? Why are people drawn to him? Beat Gugger: Without doubt, his name, but also the political arguments at the outset, have contributed much to his popularity. Hugely important, however, is the scientific sensation he created: we have an almost direct insight into his life of over 5,000 years ago. 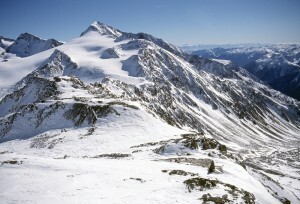 “Ötzi 20” is on view at the South Tyrol Museum of Archaeology from March 1, 2011 to January 15, 2012. The special website devoted to the exhibition includes fun sections on Ötzi-themed curiosities and arts. This entry was posted in Europe and tagged Alfons and Adrie Kennis, Andreas Putzer, archaeology, Beat Gugger, Copper Age, Iceman, Italy, mummies, Ötzi, South Tyrol Museum of Archaeology, tattoos. Bookmark the permalink.